"Haunted much? Medallion of Murder pulls us back into Nefertari Hughes’ world with a shot to the heart as our favourite young super hero deals with troubles both real and supernatural. This is a world of lush scenery and deep characters that build every time we step into its pages." After she receives a coded message from Awad, Terry and her best friend Maude are thrown into the hunt for a lost medallion, an artifact that possesses a great power—and a gruesome destiny. As each clue leads to more disturbing truths (and bodies), Terry begins to suspect she’s the real target of the search. When Awad goes missing, she becomes certain the Illuminati are involved, and has no choice but to risk losing the thing she cherishes the most to get him back. But Terry will soon discover the secrets of the tomb cannot be erased by distance or power, because the ghosts of her past are closing in quickly… and this time, they refuse to stay buried. 4.0 out of 5 starsA young adult whodunit with paranormal and historical elements making this not your average mystery. After she receives a coded message from Awad, Terry and her BFF Maude hunt for a lost medallion, an artifact that possesses a great power—and a gruesome destiny. As each clue leads to more disturbing truths (and bodies), Terry begins to suspect she’s the real target of the search. When Awad goes missing, she becomes certain the Illuminati are involved, and has no choice but to risk losing the thing she cherishes the most to get him back. But Terry will soon discover the ghosts of her past are closing in quickly… and this time, they refuse to stay buried. The first two Nefertari Hughes Mysteries were all about the Scooby-doo gang (even though there is no dog!) and that is what made the books super fun and easy reads. The same is true with Medallion of Murder! More is made of the friends than the love interest... and that's perfectly okay. I truly like Zach and I enjoyed the angst he brought to Terry's life but it is Maude, Fraser, Awad, and now with this book, blind Jackson that makes this story. The first quarter of the book I didn't know what in the world was going on. The mystery wasn't very clear to me at all but since I know Terry is able to ferret out any possible mystery I just settled back to gather clues. I found this a remarkably good mystery with a shocking and yet satisfying outcome. It's a tad more complex than in the previous books even though I knew one of the twists from the moment it was introduced I was kept in the dark about the villain for longer than I normally am! I love when I get tripped up by red herrings. I like this cover a lot more than the previous two covers which were a little old-fashioned. It's kind of nonsensical in that there is a map that doesn't really have anything to do with anything in the story and what is obviously a girl's face that is supposed to be Terry. It's not bad but yeah its not the best face cover. I applaud the attempt to upgrade even though no it looks like an indie cover instead of an old fashioned republished cover. Why did I enjoy the latest Nefertari Hughes Mystery, Medallion of Murder? The girl power in this book is so overwhelmingly good. This is what high school is all about... friendships like these. Terry and Maude couldn't be more different and yet they work! Fraser is a part of this friendship certainly and adds a great element to the girl's powerful bond. Maude gets an expanded role in this book that I just ADORED! She is a total fashion queen and her skills are used in a super fun way, all through the book and it totally worked. Terry is trying to figure out what she wants to do after she graduates in 6 months... She finds herself with a long distant boyfriend, a father who wants her to follow in her mom's footsteps and a friend "maybe more" who offers something new. She has her own ideas of what she wants to do, but will that even be possible? I loved how these different elements came together and added this whole reality to Terry's story. Seniors really do worry about all the heavy choices they have to make. The relationships they've formed may fade and grow distant to be replaced with new ones. And sometimes parents are disappointed. I really have enjoyed how we started out the series with Terry coming from unusual circumstances off an Egyptian dig... to a more normal teenage life. The fact she had a crippled leg and wore a brace to be able to walk was a big challenge for her. Then in book #2 she got to return to that life for a summer, working on a dig and testing out the waters with a childhood friend. Her leg wasn't such an issue and instead she dealt with her past and her mother's legacy. In this book she finds herself returning to circumstances she'd previously overcome... and yet it also opened a new opportunity for her. Another possible future work. It really reflects the natural flow that life throws at a person and I just love that!! It makes the Nefertari Hughes Mystery series a fun adventure that reflects the natural rhythms of life. 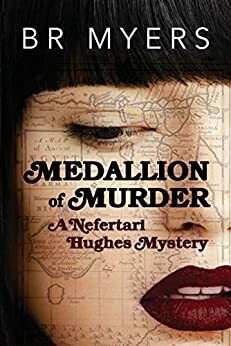 The latest Nefertari Hughes Mystery, Medallion of Murder, felt like a neat turning point in Terry's story. This is about more than the artifacts that she has been hunting down... its about her future, her friendships and her passion for solving mysteries. I can't want to see where B.R. Myers takes us from that end!